As I'm trying to post some of this years TRs (finally have a day to catch up a little! ), I forgot about this hike that I did on Labor Day. Wow, what a zoo that day! I've seen it busy in the past before but not quite like this! And this is the catch-22 for me, while I love seeing people enjoying the outdoors, this many people all at one time soured the experience just a little. 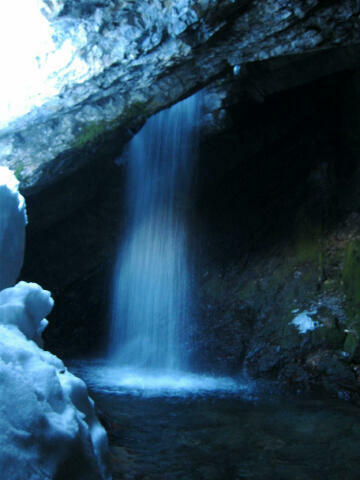 It is a short and relatively easy hike which makes it quite popular. Thankfully the trails are fairly wide so bypassing people isn't a problem. Yeah, it looks a little crowded. This is a fun hike in winter, I've done it several times and been the only person there. Were the falls frozen? That would look cool! The falls don't freeze, but the river flows under the snow so the only time you can actually see the water is at the waterfall, which becomes a really cool ice cave you must climb into. Sadly, that's the way it is at many designated nature sites all over the country. It's a matter of finding a different place away from that kind of mayhem that makes an adventure all the worthwhile. People like "packaged adventure" these days- park your car, walk a short distance to something that oohs and aaahs you, then throw your Powerbar wrapper on the ground and move on to the next place. There are many places you can still go in Utah and other states to get away from the crowds, but it takes a little more effort. Mountain guy trapped in the wetlands of Florida. ...or you can climb above onto the ridge and see no one. God's Lawnmower is one of the backcountry skiing gems of the Wasatch and it's just around the corner. Donut Falls down to the right. Whats the distance to High Falls via the Leary Trail if you start on S Shore Rd. trailhead? If Doughnut falls is that busy, I wonder if Bell Canyon Waterfall or Lisa Falls (Just to the base) would be more enjoyable. They are also right there. I hiked up to Donut Falls on Saturday. I was there between 8-9 and it wasn't too crowded and was a wonderful winter hike. By the time I headed home though, the trail was getting crowded. More than half the people on the trail were carrying sleds, so there must be a jackpot of sledding spots up there by the falls. Maybe they are just sledding down North Fork Road. Not sure. Anyway, if you want to see 360 Google Earth trail of this are in the winter, just click on the link to my blog post.